Botanical Name: Sophora japonica L. (Fam. Fabaceae). Common Name: Sophora flower, Pagoda tree flower. Dried flower or flower bud. Flos Sophorae Immaturus is the dried flower or flower bud of Sophora japonica L. (Fam. Fabaceae). The flower is known as Huai Hua, whereas the flower bud is Huai Mi. Grown in most provinces in China, it is collected in June and July, dried in sunlight, and used unprepared or stir-baked. 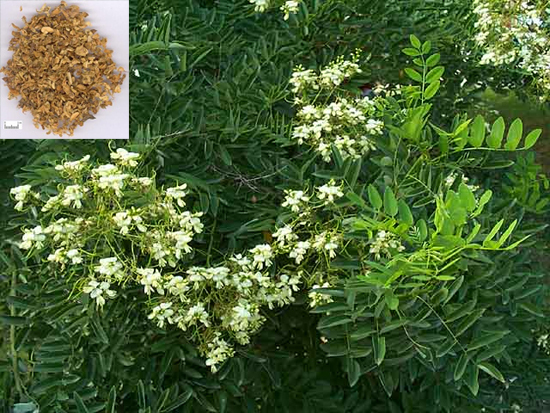 b) cough with blood and epistaxis Sophora flower (Huaihua) is used with Biota tops (Cebaiye), Imperata rhizome (Baimaogen) and Agrimony (Xianhecao). Dosage: 10-15, decocted in water for an oral dose.